WSET Level 3 - Week 5 Already!! It’s week five of our WSET Level 3 course in London and we’re really getting into the swing of things. Saying Auf Wiedersehen to Germany and Bonjour to France, we head off to taste our way through Burgundy, Bordeaux and the Loire Valley. Bordeaux is the biggest wine-producing region in France in terms of both volume and value. A few, premium wine producers can claim responsibility for its prestige, but the bulk of production is designed to be simple table wine. Bordeaux has a moderate, maritime climate that benefits from the warming effect of the Gulf Stream, and is divided into two main areas: the Left Bank and the Right Bank. However, just like us London commuters, winemakers struggle with the problems brought by ‘inclement weather’ (in this case rain and humidity), which means that each vintage varies greatly. As a result, most wines from Bordeaux are blends; it’s too risky for winemakers to rely on a single variety, as a heavy shower could ruin the whole crop in one fell swoop. The main black varieties are Cabernet Sauvignon, Cabernet Franc, Merlot and Petit Verdot. White grapes do offer one exception to the ‘blends’ generalisation, with Sauvignon Blanc increasingly found alone. The other main grape, Sémillon, is susceptible to noble rot and thus often used for sweet wines. Finally, Muscadelle supports both sweet and dry wines with its floral, grapey flavour. Burgundy is at once very complicated and easy-as-pie: it is home to enough appellations and producers to give you the kind of headache only a Burgundy Premier Cru will clear, and yet only two grape varieties predominate throughout: Pinot Noir and Chardonnay. It’s continental climate ranges from cool in the north (hence the green fruit and high-acidity of Chablis) to moderate further south (where you’ll find riper fruit flavours in wines from Mâcon). The soils in Burgundy are as varied as the weather hazards winemakers face (which range from a wet growing season and spring frosts to dystopian-sounding summer hailstorms). The best sites are located on south or east-facing slopes where they’re protected from the worst of the weather and gusty westerly winds. Burgundy’s heartland is the Côte d’Or, which splits into two main areas. For the full-bodied Pinot Noir of your dreams head to the Côte de Nuits, or if it’s a wonderfully expressive Chardonnay you’re after, follow the Massif Central down south to the Côte de Beaune. The crucial stretch of France’s longest river is the last few hundred kilometres before it reaches the ocean. Why? This is where the Loire Valley’s most important vineyards are located, loosely grouped into the four sub-regions: the Central Vineyards, Touraine, Anjou-Saumur and Nantais. As you move from the inland Central Vineyards towards the Atlantic, the climate changes from continental to maritime. The Central Vineyards is the place to go for Sauvignon Blanc, the grape in the famous Sancerre and Pouilly-Fumé wines. The best examples of the former are known for being particularly expressive, whereas the latter are said to have subtle smoky notes, as the name suggests (‘fumé’ means smoked in French). Moving west to Touraine, you’ll find the bulk of less-premium Sauvignon Blanc, along with some excellent examples of Chenin Blanc and Cabernet Franc wines. Finally, a whiff of sea breeze tells you that you’re in the Nantais region, where the early-ripening and frost-resistant Melon Blanc predominates. One of the first things we learnt was how, whilst we’ll be learning how to describe the wine’s aromas and flavours using the WSET’s systematic approach, this will never be a fully objective process because people’s sensitivities to certain tastes differ. Our teacher Melanie demonstrated this by passing round small strips of paper which we were instructed to keep on our tongue until they started to taste unpleasantly bitter – as we took them out one by one, we saw what she meant: some of us had tasted the bitterness faster than others. We went on to meet our laminated guide to how to taste wine – this will be our best friend over the next three weeks as it provides a structure to what to describe when you taste a wine and how to describe it. It seems quite complicated, but it’s actually format sticks to how you would naturally approach a glass of wine: start with its appearance, follow with what you smell and finally what you taste. After a delicious selection of cheese and charcuterie, washed down with a crisp glass of German Riesling, we were feeling very relaxed as we returned for our afternoon session. But there was no time for an afternoon snooze, as we were keen to meet our grapes of the afternoon – Chardonnay and Pinot Noir are next up for our WSET Level 2 course. Chardonnay is an unusually versatile grape variety, capable of growing in a range of different climates and producing different flavours depending on the conditions in the vineyard and winemaking techniques used. White Burgundies are famed throughout the world, with French winemakers expertly using the process of malolactic fermentation (MLF) to soften harsh acids and add a weighty, creamy texture to their wines. Other examples, such as the Chablis we tasted, see no oak or MLF, allowing the grape’s delicate, pure fruit flavours to shine through – something we appreciated in the notes of lemon, crisp apple and minerality common to wines from this village. The example we tasted from California demonstrated how, in hotter climates, Chardonnay will express riper, tropical fruits such as mango or banana, as well as a more creamy lemon. Pinot Noir, on the other hand, is known for being a difficult grape variety to grow. This is unfortunate as it widely appreciated for producing wines that are extremely easy to drink, a reputation it doesn’t have for nothing, as we learnt from the deliciously spicy Spätburgunder we tried, with notes of strawberries, red cherries and plums – and no, the wine didn’t dilute our concentration – Spätburgunder is the German word for Pinot Noir, and in fact Germany produces some of the finest examples of this grape in the world. Sadly, our second Pinot Noir failed to live up to the first, unusually expressing a very different personality on the nose than on the palate and showing us why wines are sometimes described as confused. 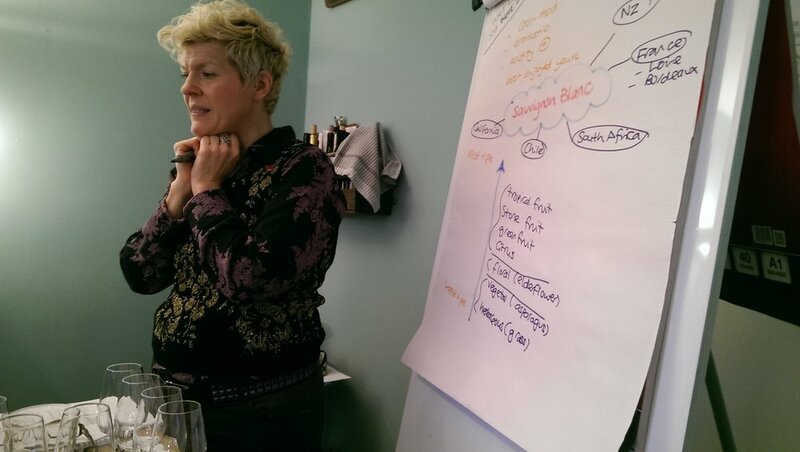 At the end of the session, we leave fairly exhausted but eager to see what wines Melanie has in store for us next week. WSET Level 2 - Class of 2016! After starting our WSET Level 2 & 3 courses back in February, they are in full swing now! Here is our Level 2 group learning all about wine making techniques.... oh and having fun of course!